Today at Geek Coffee we were considering what the next big killer mobile application is going to be. Clearly one of the hottest areas for mobile is location awareness. The Telcos have traditionally been holding the market back in this area – they’ve had the technology to be able to do this for years but unless you want to pay thousands of dollars you’re not able to get at this data. There is a change in the air and in the next couple of years I expect there to be much more in this space. Anyhow as part of our brainstorming we came up with a real gem: There is an increasing number of people complaining about the iphone and there are a large number of people who have had to take a device back for whatever reason. How about a “Return to Sender” application? 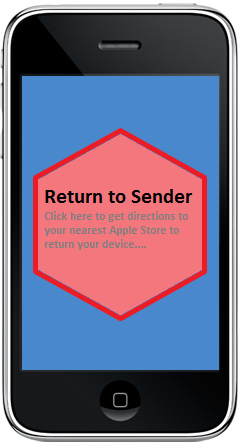 All it does is give you the quickest route from where you currently are to the nearest Apple store, where you can return your device. 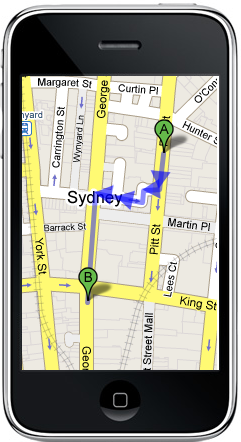 I’m sure it would take no more than an hour to knock this up and yet how useful would it be to all you iPhone users…..